This exhibition is a product of artist Pola Esther’s continuous exploration into the tangible aspects of existence. Constant inspiration manifests from her immediate surroundings and people she encounters. In the presented body of work, Esther approaches familiar products of nature and common objects with surreal, abstract, or whimsical flavor. The goal of the exhibition is to express an attitude towards beauty standards with an emphasis on feminine energy. On a deeper level it is a commentary of evanescence and an investigation into the process of aging, preserving beauty, glorifying youth’s appeal as the most visually pleasing. 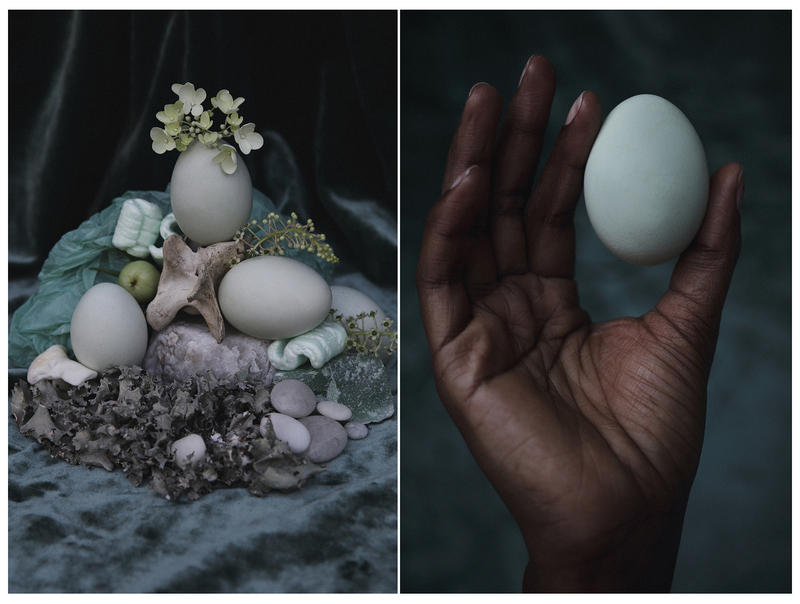 Esther wants to provoke reflections on the fantasy of immortality, dream of negligible senescence (“a lack of symptoms of aging observed in some organisms”) by exposing the physical allure of life cycles… from the beginning to the end… from eggs to apples…Ab Ovo Usque Ad Mala. Pola Esther, from Blu Flavor series, Image #1 & #2, 2018, archival inkjet print.